Although I’ve heard some activists call for a ban on all pesticides, the hard fact is that production agriculture, whether conventional or organic, will for the foreseeable future depend upon the application of plant protection products to control invertebrate pests, fungal diseases, and weeds. Unfortunately, some crop pests gain a foothold during exactly that time when honey bees have interest in foraging upon that crop — while the plants are in bloom ― thus resulting in intimate exposure of the unfortunate foragers to pesticides and their adjuvants. Notably, when it rains during almond bloom in California, most growers spray a variety of fungicides and adjuvants on the bloom — thus exposing the majority of hives in the U.S. to such cocktails (Fig. 1). Figure 1. 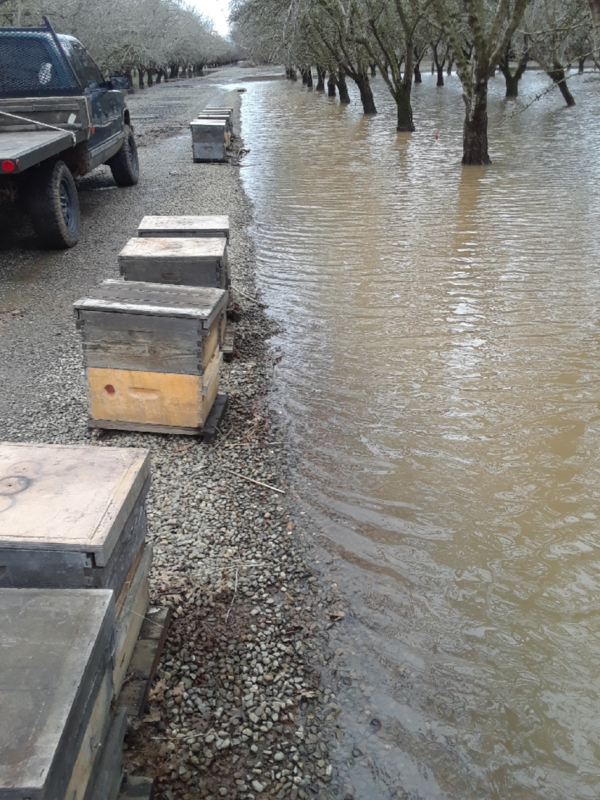 We were able to move our hives out of the flooding during our heavy rains just at the beginning of bloom ― others were not so fortunate. Under these damp conditions, we know that our bees will be exposed to fungicides. I’ll return to determining the effects of such spraying upon our hives later in this article. Another example are sunflowers, which, being native to North America, come with a number of insect pests that target the flowers, making the best time to control them being exactly when bees are working the bloom. And then there are other major crops: The pollen and/or nectar of most corn, soy, canola, and perhaps vine crops contain traces of systemic insecticides, along with adhering fungicides. Thus, the unfortunate fact is that bees are often exposed to pesticides in the agricultural landscape. Practical application: I’m no apologist for pesticide use, but I’m a realist. Our current “conventional” agricultural system has become overly dependent upon effective pest control products ― much more so than were traditional farms with multiple crops, rotating pasture, and livestock. Thus, the accepted system creates the need for pesticides, and lots of them. That’s not to say that growers couldn’t make agricultural land more pollinator-friendly — which is, commendably, the direction in which we’re headed. The sheer number of different registered pesticides (nearly 900 sold in California []) makes for a potentially-toxic stew in the hive. And as brought to our attention by Chris Mullin [], our bees must now not only deal with agricultural pesticides, but also with the often-substantial residues of miticides applied by beekeepers themselves (putting us in the position of the pot calling the kettle black). Mullin’s paper also pointed out the stunning diversity of pesticide residues found within hives. Plants have engaged in chemical warfare against their pests and predators since they first met (we humans prefer to consume plants that are relatively nontoxic to us). And the pests have continually fought back by evolving resistance to those toxic plant phytochemicals. The same thing occurs when a manmade pesticide is applied year after year. Insects, arachnids, and fungi have time and again exhibited the ability to evolve resistance to each and every pesticide thrown at them — often within a few generations (Fig. 2). Once a species evolves resistance to say, a certain pyrethroid insecticide, that may also confer some degree of immunity to that entire class of insecticides. Figure 2. The blue curve indicates the cumulative number of arthropod species that have exhibited resistance to at least one pesticide; the red line shows the number of chemical compounds for which at least one species has evolved resistance. After Gould []. Current evidence suggests that insect and weed evolution may outstrip our ability to replace outmoded chemicals and other control mechanisms. Fig. 3. 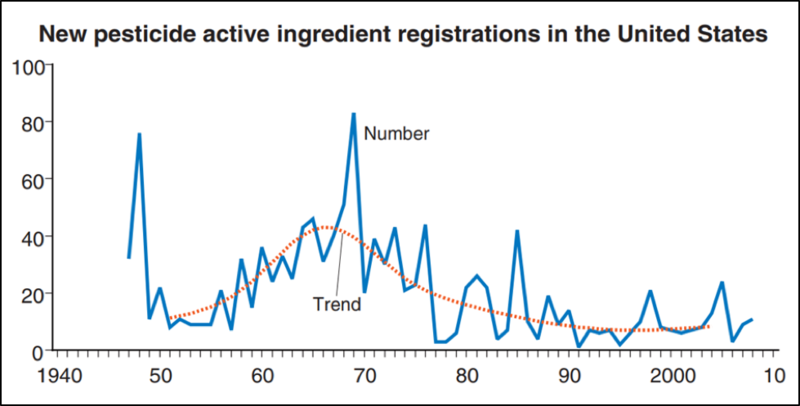 As it becomes more difficult and costly to identify and develop new active ingredients, the number of new pesticide registrations has been declining since the heyday of synthetic pesticide innovation in the late ‘60s. The dips after 1947, 1978, and 1988 were due to new regulatory requirements. Source: USDA []. It’s getting much more difficult to develop a new pesticide ― it’s estimated that companies must screen at least 140,000 chemicals in order to find one new, commercially acceptable, synthetic pesticide. The total cost to bring that chemical to market is now approaching $300 million []. And then the manufacturer’s salespeople must sell enough of the product to recover those costs before the patent runs out about ten years later ― hence the focus on developing chemicals that can be sold to a world market, and the strong sales pitches to farmers to buy them. Because of this, R&D expenditures on agricultural chemicals have been shifting toward development expenses and away from discovery research. To avoid this outcome, we must address the mix of ecological, genetic, economic, and sociopolitical factors that prevent implementation of sustainable pest management practices. Although the chemical companies will continue to screen newly-invented chemistries or “designer molecules” for possible development into pesticides, the regulatory hurdle is getting taller and taller. It appears that farmers are going to have to learn to use pesticides in a more eco-friendly and sustainable manner, rather than counting on the development of new chemistries. Practical application: As with our use of fossil fuels, our agricultural practices are due for a paradigm shift. In the United States, SYSCO, Wal-Mart and other food companies are developing sustainable farming requirements of their grower-suppliers. In 2010, Wal-Mart announced its global sustainable agriculture goals to require sustainable best practices throughout its global food supply chain. These programs incorporate requirements for natural resource and energy stewardship, reductions and restrictions of chemical pesticides and fair treatment of farm workers. Whitford also talks about trade-offs that can stop a company from pursuing registration of a new pesticide. For instance, if a promising new chemical kills the “beneficials” that normally check the buildup of that pest, the pest may rebound rapidly after an application of the chemical, and thus screw up overall management of the pest. And I’ve heard over and over again that if looks as though a chemical in development may cause problems for bees, the company will drop it like a hot potato before it wastes any more money on it. Practical application: We have only ourselves to blame for the development of resistant pests — it can be avoided by changing the look of our farms, practicing rotations and Integrated Pest Management, developing and planting pest-resistant cultivars, and especially by using pesticides more sparingly. It’s human nature to be resistant to change, and we have a propensity to rationalize why we can’t do things differently. But farming practices have been changing continually ever since the planting of the first seeds. Hey, a mere hundred years ago, virtually all farming in the U.S. was done with draft animals []; today farmers are adopting self-driving, GPS-guided, fully automated equipment. Farmers can and will change their pest control methods with time. For example, the Stockholm Convention in 1991 made of list of the “dirty dozen” persistent organic pollutants — nine of which were pesticides. Since then, the use of such products has been nearly completely phased out in the U.S. []. California has also reduced the applications of organophosphates and carbamates (which are can be acutely toxic to humans and wildlife, as well as causing neurotoxicological and reproductive issues) (Fig. 4). Figure 4. Use trend in California of pesticides that are organophosphorus or carbamate cholinesterase inhibitors. This chart shows the reported pounds of active ingredient applied, including both agricultural and nonagricultural applications. Source []. Chlorpyrifos is often the most commonly detected insecticide in bee-collected pollen, and EPA has proposed further restricting it due to the filling of the overall “risk cup” from all the insecticides with the same mode of action. But the ag industry pushed back hard, offering a very good example of how difficult it is to weigh “unreasonable risk to man or the environment” vs. “benefit” to farmers and consumers [], especially when EPA picks out a single product. Practical application: Pesticides were the most problematic to bees (and the rest of the ecosystem), back in the ‘60s – as much as we hear complaints about pesticides nowadays, in reality the situation is much better (although still far from perfect), and we can expect it to continue to improve. One of the reasons for the shift to neonics is that they appear to exhibit much less neurological risk to humans and other vertebrates. But the writing is clearly on the wall — the ag industry knows that everyone wants to decrease the use of pesticides in general, and especially the most environmentally-harmful ones. Take a look at how the almond industry has responded since beekeepers started reporting dying brood after pollination (Fig. 5). Figure 5. 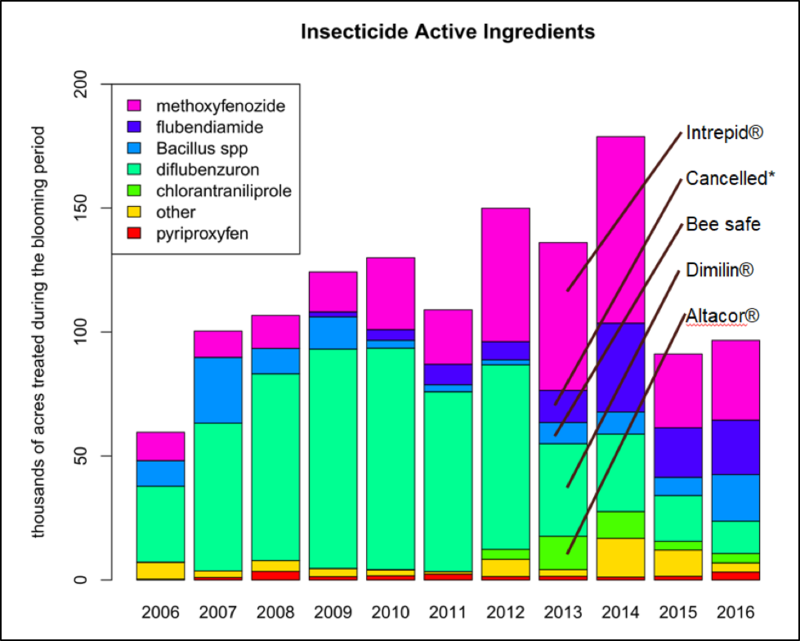 Active ingredients of insecticides (as opposed to fungicides) applied to almonds. Note how the Almond Board’s issuance of “Best Management Practices” [] has reduced the amount of the insect growth regulators (IGRs) after we discovered in 2013 that they could cause serious brood kills when applied as tank mixes during bloom []. EPA has now cancelled the conditional registration of flubendiamide, due to its adverse effects in aquatic ecosystems. Thanks to Bob Curtis of the Almond Board of California for the original graph. Note that the above chart indicates that IGRs were applied to roughly 10% of the one million acres of almonds — often with ugly consequences to the affected hives, which were often not noticed until after the hives had been removed from the orchard. A recent study from Reed Johnson’s lab [] found that Altacor®, when tank mixed with the fungicide Tilt, synergizes to create an even more toxic mix. The Almond Board is getting the word out to their growers to avoid that tank mix. The number one priority of almond growers is to produce a good crop, so if it rains during bloom, they are going to apply fungicides. But since they’re also paying a lot to rent bees to pollinate the crop, and as you saw in the graph above, they’re willing to work with us. What I find lacking is hard data on how the type of, timing of, or adjuvants added to, fungicide applications affect foraging bees. 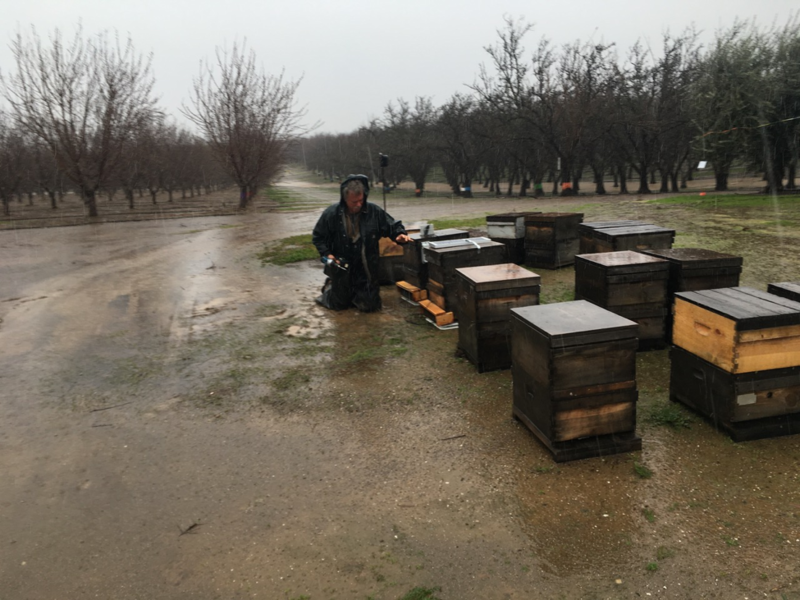 So on a lovely rainy day at the beginning of bloom this season, Huw Evans and I installed entrance flight counters on two hives in each of four different orchards (Fig. 6). Figure 6. 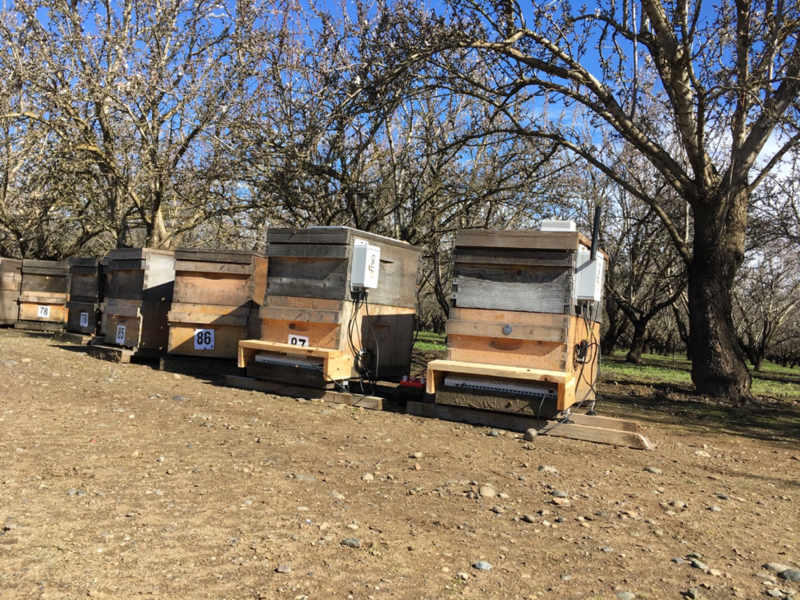 This season I’m making my third attempt to collect flight data from bee counters placed at the entrances of hives in the almonds. We hope to collect hard data on the effect of fungicide applications upon forager behavior and/or loss following a spraying. Photo credit: Huw Evans. In my two previous attempts to use entrance flight counters, equipment glitches prevented the collection of data. Luckily, technical wizard Huw Evans, who I think of as the Steve Jobs of hive monitoring (due to the user-friendly interfaces that he created for Arnia®), flew over from Italy to install custom-built devices. We owe thanks to Arnia [] and the European research project IoBee [], who helped to sponsor Huw’s trip. At the time of this writing, the counters appear to be working in good order (Fig. 7). Figure 7. This pair of hives, fitted with forager in/out counters, scales, a rain gauge, and transmitter are at the U.C. Davis experimental orchard in the “almond city” of Arbuckle (I’ve provided the hives for this research station for over 30 years). Note that the first blossoms are just starting to open. The orchard manager will record the exact times of application of any sprays. The counters above produce counts of bees exiting and entering over time, as shown below (Fig. 8). Figure 8. 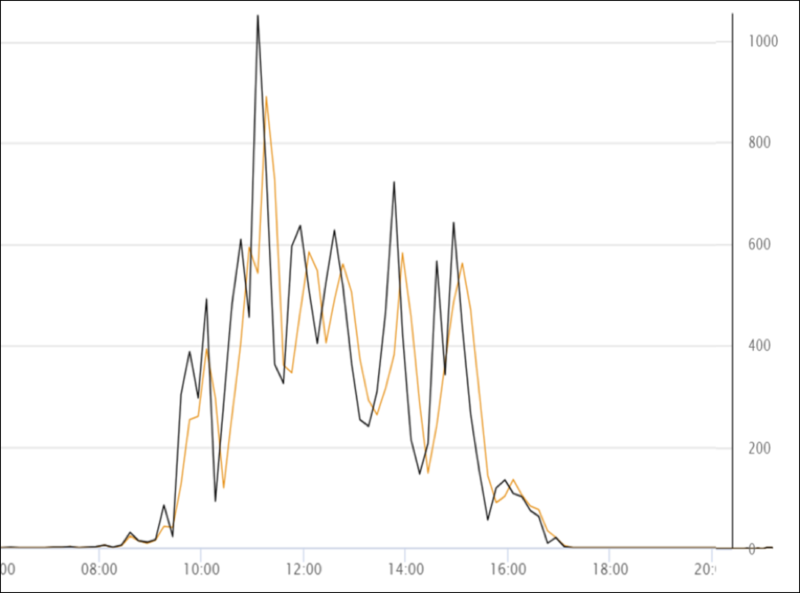 Here’s a snip from the record of one day’s bee flight, with the bee count to the right, and the hour below (we’re also collecting ambient temperature and weight gain data). The black line indicates the number of bees that flew out; the orange line those returning. As expected, not as many return as exit. I hope to see exactly how fungicide spraying affects foraging activity and the return rate. 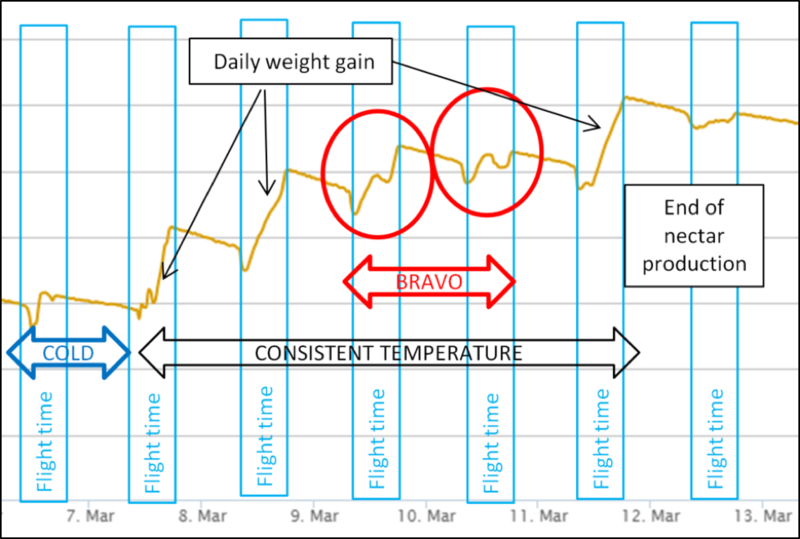 In 2017, although the flight counters hit a glitch, we were able to collect weight data from a single hive, spanning the period of a fungicide application (Fig. 9). Fig. 9. Note the strong daily weight gains from the remaining almond bloom on 7 and 8 March, indicating vigorous foraging activity. That foraging appears to have been disrupted by the ground spraying of Bravo fungicide on 9-10 March, suggesting that the bees avoided foraging or were killed, especially on the 10th. Foraging resumed on 11 March. Although the foraging disruption above occurred after nut set, the weight gain record certainly indicates that the fungicide application had a strong effect upon either bee activity or mortality, and would likely have greatly decreased pollination had it been applied during full bloom. Growers would be interested in such information, and might be willing to adjust their fungicide applications if they felt that it hurt the pollination services that they were paying so dearly for. My hope is that this year’s actual flight data will give us a clearer view of the effect of such sprays, and help us to improve the industry’s Best Management Practices. Thanks to Huw Evans, Pete Borst, Bob Curtis from the Almond Board, and to all the others who have taken the time to answer my questions. Mullin CA, et al (2010) High levels of miticides and agrochemicals in North American apiaries: Implications for honey bee health. http://dx.plos.org/10.1371/journal.pone.0009754. Gould, F, et al (2018) Wicked evolution: Can we address the sociobiological dilemma of pesticide resistance? Science 360: 728–732. USDA (2011) Research Investments and Market Structure in the Food Processing, Agricultural Input, and Biofuel Industries Worldwide. Economic Research Report Number 130. Sparks, TC (2013) Insecticide discovery: An evaluation and analysis. Pesticide Biochemistry and Physiology 107: 8–17. I confirmed by checking the 2016 California Pesticide Use Report.